Optical Coherence Tomography or OCT as it is more commonly known is a sophisticated scanning system that produces highly detailed images of the retina. It is often likened to an MRI for the eye. 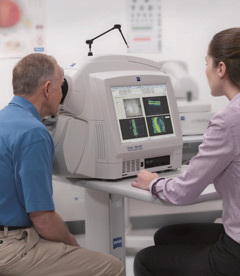 This scan allows your optometrist to see detailed images of the retina (the inner most layer of the interior eye), enabling them to accurately detect, monitor and control changes to the retina. This procedure is currently the only one that shows in-depth images of the eyes internal structures. Other procedures only show the surface of these structures.